At BMW’s Efficient Dynamics Innovation Days 2014 in Germany, the company provided the first opportunities for test-driving the BMW X5 eDrive plug-in hybrid (PHEV) prototype. BMW also presented the first four-cylinder member of its new EfficientDyanamics engine family—the 2.0-liter unit would serve as the engine component in a future production X5 eDrive PHEV—as well as ideas for future solutions in the field of lightweight design, aerodynamics and thermal management. 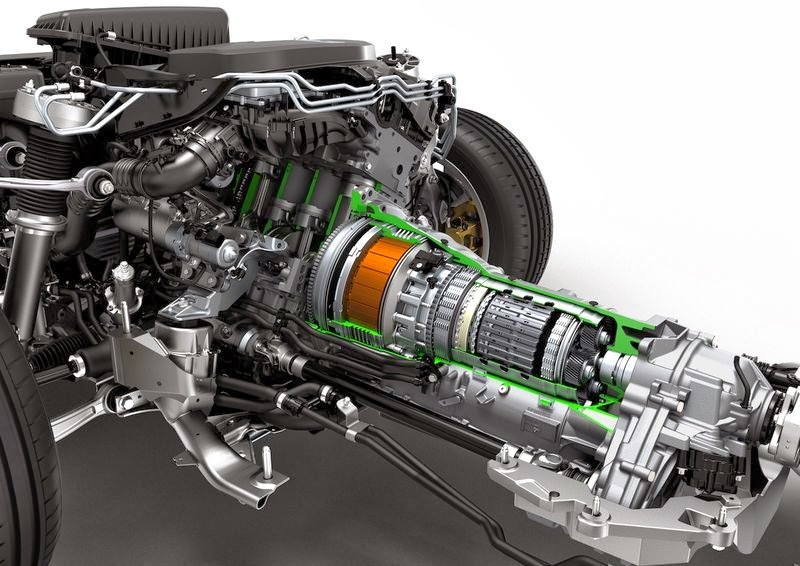 Powertrain technology is key to BMW’s EfficientDynamics strategy, with a dual focus on the continuous evolution of conventional internal combustion engines on the one hand and the development of alternative drive concepts on the other. As well as achieving significant emissions reductions based on continuous evolutionary advances of the TwinPower Turbo gasoline and diesel engines, future BMW core brand models will also benefit from the transfer of new electrified drive technology (BMW eDrive) developed by the BMW i sub-brand. All BMW eDrive components are developed in-house by the BMW Group and customized as necessary to suit different powertrain applications. Current examples are the all-electric BMW i3 and the plug-in hybrid BMW i8. The BMW i8 is at the leading edge of the Efficient Dynamics strategy; the technology used in the i8 powertrain will find its way into vehicles of the BMW core brand. The plug-in hybrid powertrain of the production BMW i8 unveiled at the 2013 Frankfurt Motor Show (earlier post) combines electric drive with a highly turbocharged internal combustion engine. With its combined maximum output of 266 kW/362 hp, combined peak torque of 570 nm (420 lb-ft), 0 – 100 km/h (62 mph) acceleration in 4.4 seconds, EU fuel consumption of 2.1 l/100 km (112 mpg US) and CO2 emissions of 49 g/km, this plug-in hybrid sports car shows that it is possible to improve performance and reduce fuel consumption at one and the same time. The electric motor provides a boost effect that assists the gasoline engine when extra accelerating power is required. It can also act as the sole source of driving power, providing a maximum speed of 120 km/h (approx. 75 mph) and a range of up to 35 kilometres (approx. 22 miles). Its power is supplied by the lithium-ion high-voltage battery pack. During overrun, the high-voltage battery can be recharged via the electric motor. It can also be recharged by the electric motor when power demands allow. The high-voltage starter-generator, responsible for starting the engine, can also be used as a generator to charge the battery. Plug-in hybrids are efficient whether used for short-distance or for long-distance driving, or a mixture of the two. Intelligent powertrain management ensures that both power sources always work together optimally. 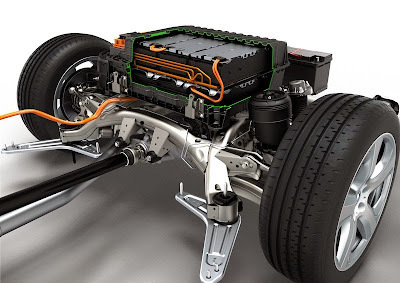 Power sharing between the internal combustion engine and the electric motor is managed in accordance with load and driving situation. Driver preferences are also taken into account, with a bias either towards sporty, dynamic performance characteristics or towards extra-energy-efficient operation of the overall system. To set these characteristics, the driver can choose from a range of pre-selectable driving modes, offering very dynamic, more comfortable or highly efficient operation. Powertrain electrification has enormous potential for reducing fuel consumption and emissions—even for large, heavy vehicles—without compromising performance and dynamism. Quite the reverse, in fact, BMW noted: the boost function of the electric motor, the additional drive torque of which supplements the internal combustion engine during low- and mid-range acceleration, significantly enhances the sporty driving experience. As a further step in the Efficient Dynamics strategy, there are plans in the medium-term to transfer the advanced powertrain technology of the BMW i8 to vehicles of the BMW core brand as well. 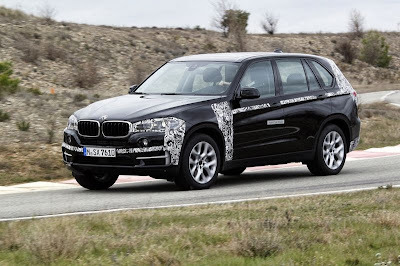 The BMW Concept X5 eDrive model presented in September 2013 at the IAA in Frankfurt showed a way in which Sports Activity Vehicles can be made more efficient. The SAV concept model combines the BMW xDrive intelligent all-wheel-drive system with a new BMW plug-in hybrid system. Supported by the boost function of the electric motor, the SAV can deliver powerful acceleration and a 0 – 100 km/h (62 mph) acceleration time of less than seven seconds. The development goal for this model is average fuel consumption of approximately 3.8 liters per 100 kilometers (62 mpg US) in the EU test cycle, and CO2 emissions of 90 grams per kilometer—new benchmarks in this vehicle category. The vehicle is also capable of all-electric operation for up to 30 kilometers (more than 18 miles), in which mode its produces no emissions at all at the point of use. With synchronization of the BMW eDrive technology with the intelligent BMW xDrive all-wheel-drive system, the drive torque from the electric motor, the four-cylinder gasoline engine or both power sources operating in tandem can be split in a variable ratio between the front and rear wheels. The split is automatically controlled to provide superior traction, optimal stability and highest standards of agility and performance under all conditions. Whereas the BMW i8 is fitted with the BMW Group’s highly turbocharged three-cylinder engine, the future BMW X5 eDrive will use an advanced four-cylinder gasoline engine from the same family—the new Efficient Dynamics engine range with TwinPower Turbo technology. BMW said that this demonstrates its overall aim of providing a customized electric mobility solution in every model series. The new Efficient Dynamics engine family comprises three-, four- and six-cylinder units. By increasing the aluminium content and using magnesium, the BMW Group has also achieved substantial reductions in the average weight of the new engines. At the same time thermal management and acoustic properties have also been improved. The first member of this new engine family is the 1.5-liter three-cylinder gasoline engine making its debut in the BMW i8. BMW is now presenting the first four-cylinder engines in this new engine family. These 2.0-liter engines with TwinPower Turbo technology will enter the market in the first half of 2014, in both gasoline and diesel versions. “TwinPower” stands for a combination of variable load control with advanced injection technology. TwinPower incorporates fully variable components such as VANOS or Double-VANOS seamlessly variable camshaft timing; VALVETRONIC variable valve control; and/or VNT (variable nozzle turbine) turbochargers on the diesel models. These are complemented by High Precision Direct Injection on the gasoline models, with common-rail direct injection on the diesels, and finally by the third element in this high-tech concept—turbocharging. A feature of the gasoline models continues to be VALVETRONIC throttle-free load control. Common to all units in the new engine family is an in-line configuration. The core engine comprises cylinders with an individual displacement of 500 cc. This means the new three-cylinder engine has a displacement of 1.5 liters, the four-cylinder engine 2.0 litres and the six-cylinder unit 3.0 litres. Thanks to construction commonality within a combustion type, the proportion of shared components has increased to as much as 60%, while design commonality between gasoline and diesel engines is approximately 40%. Finally, all the engines run cold on the intake side and hot on the exhaust side. This is one reason why the three- and four-cylinder engines from the new family can be mounted either longitudinally or transversely in future BMW and MINI models. With the new modular engine family, the BMW Group is able to develop three-, four- and six-cylinder engines with different power ratings that are suited to different vehicle concepts. This makes it possible to achieve higher production volumes, leading to significant savings on development and production costs. At the same time the high level of design commonality between the engines makes it easier to develop additional versions and makes it possible to build relatively small volumes of such engines at short notice and cost-efficiently. As a result it is now possible for the first time at the BMW Group’s engine plants to build both gasoline and diesel engines from the new family at the same time, on the same production line. That allows for flexible responses to variations in demand or in market trends. In COMFORT and SPORT modes, the proactive drive system adapts the automatic transmission’s shift program to the driving situation. Whereas a conventional shift strategy is “blind” and only operates reactively, in response to throttle position and driving resistances, the Proactive Driving Assistant makes it possible to “anticipate” the route ahead and to adapt gear changes appropriately in real time. The coasting function (on models with automatic transmission) disconnects the engine from the powertrain at speeds between 50 and 160 km/h (approx. 30 and 100 mph), allowing the vehicle to coast using only kinetic energy. The proactive drive system also improves the dynamic characteristics of the vehicle, whether in ECO PRO mode, which is geared to maximum efficiency, in SPORT mode, where the automatic transmission uses a performance-biased shift strategy, or in COMFORT mode, which adopts a more relaxed, easygoing strategy. If the vehicle is approaching a curve, the transmission automatically changes down to the most appropriate gear, if necessary making use of engine braking effect. All the necessary shift operations will have been completed by the time the vehicle enters the corner. If the system detects that another bend is coming up very soon, it identifies the radius of the corner and again selects the optimal gear. This ensures that higher engine braking power is available on approach. The power reserves available for subsequent acceleration are also increased, while unnecessary gearshifts and hunting between gears on or between bends is avoided. The proactive drive system works in a similar way at roundabouts, intersections, turn-offs and at slip roads on or off motorways. Regardless of the route specified in the navigation system, the proactive drive system also reacts to the use of the direction indicator.